Ever heard of the ATO’s “Small Business Superannuation Clearing House”? And it is a title that should make the hairs on the back of your neck stand up. Because what it is, is the beginning of the end of your chances of ever seeing all of your super. Or possibly … worst case scenario, but ever the more likely the younger you are … the beginning of the end of your chances of ever seeing any of it. Exactly as predicted and forewarned by this very blog for months now. Your humble blogger found a very interesting letter in his In tray on arriving at work yesterday. From the Australian Tax Office (ATO). It is proof positive of what I have been repeatedly warning readers is coming, in our near future. Our government … both “sides” … are planning to steal our super. There is something particularly interesting about this letter (copy below) from the Australian Tax Office to my own small business. It proves that the Green-Labor government are now going to steal your super by means of a policy idea that they have stolen from the Liberal Party. The lazy incompetent useless public-trough-swilling bastards presently “running” our country (into the ground) can’t even come up with an original way to thieve and pillage your retirement savings – so they’ve resorted to stealing a Liberal Party plan instead. That story was broken right here on barnabyisright.com on June 7th, just 4 days after the Liberal Party quietly announced it as their policy – “Liberal Party’s Sneaky Plan To Steal Your Super To Pay Labor’s Debt”. I strongly urge you to first read the article linked above. And for a full background of a world in which governments across the globe – including the USA, UK, France, Ireland, and many more – are all sneakily stealing their citizens’ super, please read “Stealing Our Super – I DARE You To Ignore This Now”. It will help you to be properly prepared for today’s shock news. Finished? You now understand what is happening in the big bad world of superannuation theft, and what the Liberal Party’s sneaky plan is? The government’s new Small Business Superannuation Clearing House is an ATO department. The government plans to have your employer send your superannuation directly to their ATO “Clearing House” … not directly to your super fund, as it is now. It’s all so well-intentioned, you know. Really. It’s all so very innocent … a “helpful” “reform”, only intended to save your boss time and hassle, of course. And this is unquestionably a Liberal Party policy. The only difference, is that the ALP’s version of this policy to steal your super is … surprise surprise … less efficient than the Liberal’s version. Because the Liberal’s version planned to encourage employers to send your super to the ATO, along with their quarterly GST (BAS) payment. Your super, and their GST. All in one easy payment … to the ATO. That’s Liberal Party efficiency for you. By using the deceitful disguise of a great “helpful” “reform” to “cut red tape” for small business, the Liberal’s policy sneaks under the radar with the attractive appeal of killing two birds with one stone … saving the employer even more time and hassle. And both sides of politics present their sneaky scheme scam to steal your super using exactly the same kind of warm and fuzzy, butter-wouldn’t-melt-in-our-mouths and you-can-trust-us-we-wouldn’t-harm-a-fly language style. Are you a small business or organisation with fewer than twenty employees? If so, you are eligible to use the Small Business Superannuation Clearing House (Clearing House). it helps you meet your superannuation guarantee obligations. Arrrrrrgggghhh! Am I in the presence of one of those pathetic spruikers standing outside a low-rent retail shop wearing a gaudy suit and brandishing a microphone whilst annoying the passersby? I think I’m drowning in snake oil! I’m “eligible” to use this wonderful new service of the ATO? Wow! I feel so blessed, so honoured, to be a chosen one. For small business men and women, less paperwork means higher profits, boosted sales and more time with the family. Oh wow! Yes please Mr Abbott! I want relief from the terrible burden of conscientiously looking after the best interests of my wonderful, hard-working, loyal employees, who are really more like family … I really really do! How could we employers not all leap and dance with exultant rejoicing about that! All that terribly challenging and time consuming “red tape” work … of clicking “print” and printing off several different envelope address labels to different super funds (or sacre bleu! hand writing each one!!) … once every 3 months … saved! Now, all thanks to our wise and caring government, we employers can just print one envelope every 3 months. Make one electronic funds transfer. And send all your super, dear employed reader, straight to the ATO. Naturally, we can all completely trust the ATO to pass it all on immediately to your super fund. And not, perchance, happen to sit on those tens of billions per quarter for (let’s say) a few weeks, and thus siphon off some short-term money-market interest for themselves first. Yes, oh yes, dear reader … of course we can trust the ATO to do the right thing with your super. Just like we can trust Green-Labor and the Liberals not to cast their greedy eyes over Australia’s existing $1.3 Trillion pool of citizens’ superannuation, and concoct oh so reasonable-sounding, “helpful” “reforms” that just happen to steer your retirement savings into their own coffers. To pay down the debts they have accrued. To fund their lavish, all-expenses-paid, high flyer lifestyles. And … to finance their index-linked, high 6-figure retirement in the lap of luxury, after they’re done ruining the country for all the “little people”. 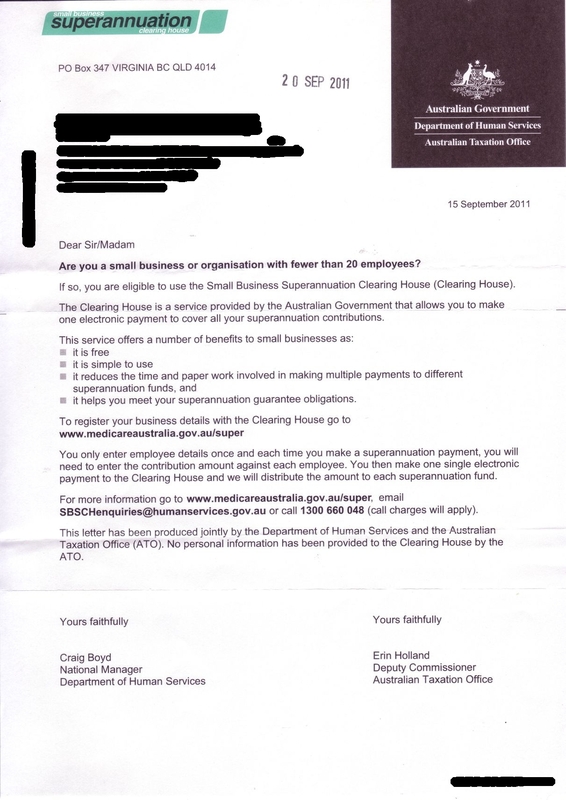 The new ATO “Small Business Superannuation Clearing House“. Oh, yes. It’ll be “clearing” out your super all right. Don’t you worry about that. Here’s roughly how it will go, dear reader. Stage 1 – it’s already here … a “helpful” option, just for small business (who employ 60% of all Australian workers). Stage 2 – this “helpful” option extended to include larger businesses. Stage 3 – the option is no longer an option. Stage 4 – a financial crisis or other plausible-sounding excuse is used to justify compulsory acquisition of some (or all) of your super. Exactly like what has already happened in the USA, UK, Ireland, France et al. Once again, it will be touted loudly by our political overlords as a “helpful” “reform” … perhaps to “preserve” what is left of your super after another market crash, via putting your super into a (compulsory) “government-guaranteed” “safe” “investment”. Fabian socialist tactics at their finest. It’s long past time for real change in our political system. Beginning with … bringing to an end the entrenched “Two Major Party” political system. A perverse system that is ably supported and sustained by its lifeblood – our wholly undemocratic compulsory voting system. There is a way to change the system, dear reader. And your humble blogger will have more news on how you can get involved in making it happen … soon. Personally, I’d suggest a Self Managed Super Fund and then enrol in a Horticulture class somewhere. Then I’d take up the wonderful pastime of gardening…..sometime after midnight seems like an appropriate time. LOL! How aptly and eloquently put. Human Services??? Medicare??? ATO in disguise??? What the hell doesn’t medicare do – oh that’s right, it doesn’t pay for your medical care. The joint’s rooted! So, Tomorrow’s Serf, when are you going to change your name to Today’s Serf? It can’t be long now!! I’m the “Eternal Optimist”…. and we all know that tomorrow never comes!! Wouldn’t that make you a realist? The government tapping the float? I’m shocked I tell you… shocked! 100 million for poor countries, that’s cutting the debt back isn’t it. Cut back the NBN, or finish what they have started no more, not put any more money subsidies into clean energy, subsidizing wind mills, and solar farms, then the 2 billion debt looks a lot healthier. How can the government access privately run superannuation schemes, only government employees surely? I came into the employment force too late for super, what I got I was employed casually, so got my money given back. But one of my son’s works for a club, and he has the clubs superannuation fund managed by a company dealing in club employees. How can the government get union super too. Read the linked articles that I’ve written on this previously, Bushbunny. They explain how other governments around the world are doing it. This new move by our government is just a little first step. They are not accessing existing super funds (yet). What they are doing is suckering small business people into sending employees future super payments (paid every 3 months) to the ATO .. not direct to the super fund. We have to trust the ATO to pass that money on to the fund … immediately … without siphoning any off, or using it to make short-term profits for Consolidated Revenue before sending it on to the employees’ super funds. It’s the thin end of the wedge. As I wrote in the article, and have predicted for a long time, the next steps (after this first quiet, “innocent” little one that will fly under the radar) will be to expand the new system to include all employers, not just “small business” employers; so that ALL future super payments from all employers can optionally go to their employees’ funds via the ATO; then, next step will be to make it compulsory, not optional. Just repeating – this first step is not about accessing existing super funds. It is about diverting future super payments from the employer, to flow to the funds via the ATO first. Well if you say so Blissfull, but I know that my small business employer sent my super into the ATO, and months later, my accountant got a letter from ATO asking where I wanted it to go. It was $36.00 would you believe. I eventually got a cheque for $33.00.sent to me direct. But what you say sounds very suss? But why did the Libs go for this too? If it is secured and guaranteed, what do they want, a loan with interest. The Libs suggested it first, as their own policy. The ALP have simply stolen the policy and implemented it themselves. As I keep trying to inform folks … you can’t trust either “side”. They’re not in the game of showbiz for ugly people politics because they want to “serve” the public. They’re all in it for one thing: the power and the glory … the applause and adulation of the crowd/s (no matter how small). Politicians are by nature (and with extremely rare exceptions), narcissistic egotistical self-serving cretins. Thinly concealed beneath a thin veneer of false humility and a pretended desire to “help”. They’re actors. Always have been. Always will be. Since the dawn of time. Well Blissful, that says a lot for Barnaby doesn’t it. Yes I agree they are performers to a stage of often hopefuls or those that are leaning on their very words for enlightenment. But somewhere, on occasions, they hit the nerve when they talk and act as if they understand and will act for the benefit of all. Some do present and also function as they present themselves. Even Hawke for example. The present politicians are not giving a strong ethics and also leadership as is required. Even Abbott I like him actually, even with the negative persona of ‘budgie smugglers’. But he is impeded because of Turnbull who presents as a more sophisticated man, and educated, but I don’t think he meets the requirements of a politician purely because his stance on carbon tax and carbon credits that is believed because of his previous connections with Goldman Sachs, may have financial influence on his personal politics. You know the first country to help us when Darwin was destroyed. The Arab Emeritates and Saudi Arabia. We should start looking after ourselves now, with funding to avert flood damage, bush fires, and extreme weather events. Bugger this giving 600 million a year to the United Nations Climate Change Fund per year to help these countries who reckon they are suffering climate change environmental damage caused by us and other developed countries. Clean energy, it is a waste of money. Update our present coal fired generators, that will eventually supply enough energy per capita, but also cut carbon emissions. All we need now is a leader to say strongly, ‘The science provided by the IPCC is not proven, and the Critical climate report from our government (that had a disclaimer) is out of date’ CO2 does not drive the climate. There is no evidence, and clean energy will not solve environmental or climate change heating. HOWEVER, we need to support genuine sustainable efforts to adapt to any climate change such as may be experienced in the future that will effect our ability to provide food….’ And our energy requirements that drive our economy and life styles in this country. Carbon from additional CO2 can become part of more plants and animals. But, plants first.